They are privacy and shelter are two important things in the garden. The latter is often a problem in gardens which are exposed to cold prevailing winds. Both these points are important not only for the gardener himself, but also for the plants in his garden. Young growth can be severely damaged by cold winds and frequent buffeting will cause a great deal of root disturbance. Although privacy and shelter can be provided by trees and shrubs, fences also have an important part to play. Strength is very important. A fence is only as strong as its supports. Most fences are supplied with strong posts, usually 4-6in (10-15cm) square. Sometimes concrete posts are supplied; these are extremely strong. Strength of timber also depends on the prevention of rot, and unless cedar wood is used (except for posts), all timber should be treated with a suitable preservative. Creosote can be used, although it should be allowed to soak into the timber for several weeks before plants are trained against it. Unless this is done, there is the danger of stem and leaf scorch and its use is not generally recommended where plants are to be grown against or near a fence. A safer treatment consists of the use of copper naphthenate preservatives such as the green, horticultural grades of Cuprinol or Solignum. The most popular types are purchased as units or panels. Usually they are from 5-6ft (1.5-1.8m) in length with heights varying from about 3-6ft ( 90cm-1.8m). A solid or close boarded fence is, as its name implies, a design which consists of upright or horizontal strips of wood, some 6in (15cm) wide and 1in (2-2.5cm) thick. The strips are nailed to two or more supporting rails at the rear of the panel. These provide complete privacy and wind protection. Weather board fencing consists of wedge-shaped strips of wood, (1 in 2cm) in thickness at one edge, tapering to 0.5 in (1cm) at the other. Each strip overlaps the next by about 1 in(2cm). The advantage of this design is that it is virtually peep proof. Trellis fencing is suited as a support for climbing and trailing plants. It is not a strong design but can be used to good effect for covering unsightly walls or as an additional part of a fence design. It usually consists of laths of wood 1 by 3/4in ( 2.5 by 1.5cm) thick, fastened across each other vertically and horizontally to form 6-8in (15-20cm) squares. The laths are attached to a more substantial framing of 1 or 1in (2.5 or 3cm) square timber. One of the latest advances in fence production is the sale of kits which are so accurately machined and complete that even an unskilled person can erect panels without any trouble. With these kits have come new ideas in design, and many can be made up into contemporary designs. This is especially useful where bold effects are required in the construction of patios. 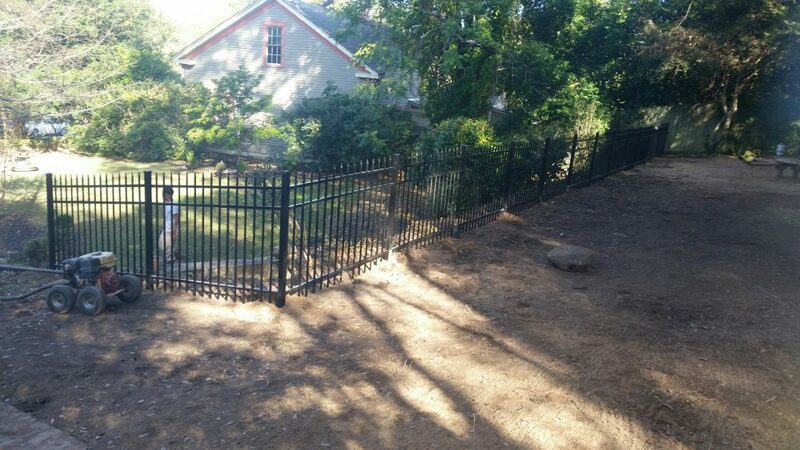 Many ultra-modern properties are being built and this advance in fence appearance will be welcomed by their owners. Fencing can also be provided in the form of chain link or mesh netting. The best quality is heavily galvanized to withstand the rigors of the weather. A more recent innovation is the plastic coating of chain link over the galvanized wire. Standard colors of dark green, black, white, yellow and light green can be obtained.